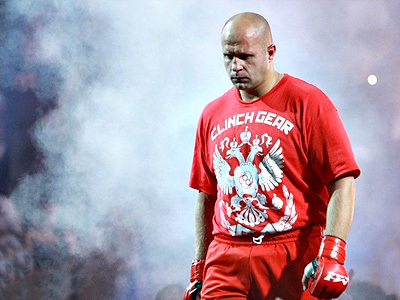 The best mixed martial arts fighter on the planet, Fedor Emelianenko, is to make his return to the ring on February 12. ­The Last Emperor will face Antonio "Bigfoot" Silva in East Rutherford, New Jersey, as part of Strikeforce's planned heavyweight tournament. The event is also expected to pit Strikeforce heavyweight champ Alistair Overeem against Fabricio Werdum, Andrey Arlovski against Sergey Kharitonov, and Brett Rogers against Josh Barnett. The Silva bout is going to be one of four fights organized in accordance with the new contract between the Russian athlete and Strikeforce promotion company. The 34-year-old Emelianenko has been out of action since his sole loss to Fabricio Werdum in June last year, but now he says he is well prepared for the comeback. "I have been training very hard since my last fight and can't wait to get back in the cage. Strikeforce has assembled a roster filled with the best heavyweights in the world and, together with M-1 GLOBAL, we have the opportunity to fight the best in a great tournament format," he told Sherdog.com. The defeat was the first Emelianenko has suffered in ten years, and the second in his whole career. The Russian has so far collected 31 wins in the ring. A rematch against Werdum is on the cards as the Brazilin said he is ready to once again face Emelianenko, whom he called the greatest fighter in the world.